A very valid question! Many people will probably think it is a waste of time – they have a good grasp of the English language, they can read, they can write, and they can check their own work – ‘nuf said. However, the problem here is that when writing your thesis / book / website page / CV / whatever else, you know exactly what you want to say. 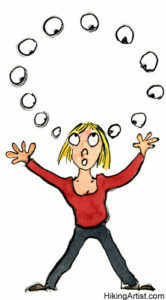 So when you read back over the work, you will read it as you intended to write it – and this is where the problem lies. For example – you are typing away, quickly, (perhaps your deadline is looming) and you want to write ‘from then on’, but due to your speed, and possible tiredness, you accidentally write ‘form then on’ or ‘from then no’ (a small error that a computer spell check may not highlight). However, because you know what you intended to write, it is likely that your eyes will simply see how it is meant to be read when you do your last minute checks. ENTER YOUR PROOFREADER! I have no connection to the text, and that, along with my trained eyes, means that I can pick up on the errors that you miss. That is my job. These examples may seem basic, but it is always those subtle errors that are the ones that are missed in the final check. Other very common errors include the misuse of hyphens, apostrophes, and Latin terms (such as i.e. or e.g. ), as well as the mixing of British and American English (the two are actually very different!) and missing out words. This list is by no means exhaustive, but it gives you an idea of how much can actually go wrong in writing! We are not just simply here to check your spelling and grammar – we are here to help you ensure that all aspects of your work are perfect. And yes, before you ask – I did ask someone to proofread this. 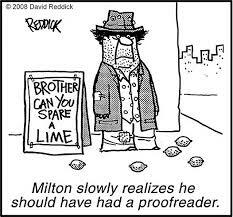 Even proofreaders need their work checked!